ScreenCamera is a powerful gadget for Windows that allows users to stream the desktop screen on live video chatting sections. ScreenCamera can be used by multiple applications simultaneously and works perfectly with MSN Messenger Yahoo Messenger Skype AOL Live Messenger PalPalk Camfrog AIM Stickam AnyWebcam or any other video conferencing program or website. ScreenCamera can be used to provide cost-effective remote technical support demonstrate software applications review documents give presentations share photos and videos and more. ScreenCamera is designed to work with the desktop and webcam simultaneouly supporting sizing positioning and changing of settings on-the-go without ever stopping the video output. 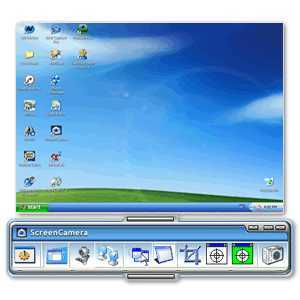 ScreenCamera is also packed with special features to allow easy desktop manipulation and zero interference while sharing your screen. It even remains invisible for those remotely viewing your desktop.Whether youre a business owner who wants to provide live technical support to your customers without spending lots of money a home user who wants to share photos and play movies using your preferred instant messenger an executive who is looking for a cost-effective way to review documents or demonstrate software applications online ScreenCamera has the tools that you need. And it is free!